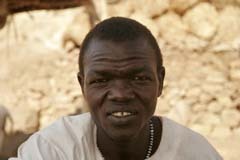 Abdollai, born in Katcha in 1970, is an artist who draws pictures of life in the Nuba Mountains on kalebases and gourds. He is also a man of few words. I left Katcha because of that war. I went to the South and came back with the bataillon that went to the Western Mountains. Later they sent me to head quarters when it was in Tabanya; from there I was sent to Kurji and from Kurji to here. I fought upto 1997, when I was asked to do the work of the tradition. Yousif [Kuwa] freed me from everything to do this work, unless there is fighting, then I come myself. Yousif asked me to do this work. He just said "we want to preserve the culture". First I draw lines on the gourd with a pencil. I engrave them with a fine screwdriver. then I burn seeds of laloup (a local fruit) and I use them to blacken the lines. I took the technique from others, there were people doing it. Nobody taught me how to draw, I learned it by myself. When I am working on the gourd and the idea for the drawing is in my mind, I am sitting normally, but when I sit without any work, I sit like I am tired. There are some others in Katcha who can decorate gourds but they don't work hard. A gourd would take them weeks, while I can make three a day. 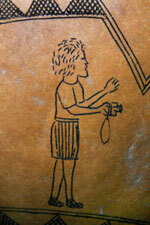 The drawings are not specially from Katcha, they are for all the Nuba. Some people use the gourds to drink from - they are good for marissa (sorghum beer) - others keep them for decoration. They buy them, but I also cultivate; the money from the gourds is not enough to live from. People now have some peace, they are not tired anymore. There is no more trouble. I used to draw guns and soldiers and airplanes, now I will draw people and animals. I will cultivate and continue the work [on the gourds]. I want to develop my work and I want to make a place where I can present the gourds - like a shop. If tourists come to Jageba they can buy my gourds.